The high-quality of your products is the result of first-class production processes, which in turn depend on a high-performance and reliable technical infrastructure. Our many levels of services enable us to guarantee that you can always rely on this foundation. We are at your side to answer all of your questions regarding lubricating, preserving and cleaning. Beginning with the concept through to commissioning our systems we support you during every phase. 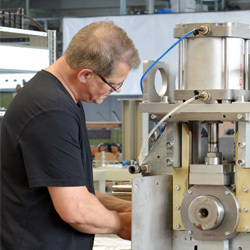 We ensure that the systems fit seamlessly and efficiently into existing production lines. We are there when you need us with our top-drawer service and retrofit programme. No matter what it is: we are always there for you - pure and simple! 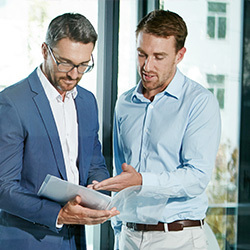 We support our customers based on perfectly harmonized, closely coordinated services from a single source supplier – precise, individual and flexible. Which is the most suitable method to meet my requirements? Which device offers me the best-possible range of performances? How can I organize lubrication as economically as possible? The best thing is not to try and answer these kinds of questions off your own bat. Let us do that – so you profit from our many years of experience and high levels of innovative energy in all fields of industrial lubrication. We offer you comprehensive, expert advice on all aspects of the lubrication process. That begins with an extensive survey of your production environment to efficient interfacing between upstream and downstream processes through to concrete recommendations regarding the choice of lubricant. It goes without saying that we also support you in the event problems occur, no matter which technologies and devices you use. Many years of practical experience mean we know many processes in numerous branches down to the finest detail; that enables us to assess precisely which lubrication concept fits your circumstances the best and will achieve the best effect over time. No matter if you are an old hand at lubrication or wish to get into the business – with us you have come to the right address no matter what! What can we do for you? The best thing to do is make an appointment now for a non-binding consultation. 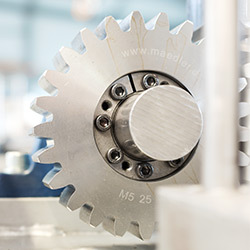 Moreover, we give you this promise: we fulfil every customer preference with regard to lubrication and develop the best solution to meet those specific requirements – no matter how far we move away from our existing technological comfort zone. How can we help you? You too can benefit from our flexibility and innovative energy to develop engineering solutions to specific requirements. We make sure that your lubrication system is up and running. Not any old how – but perfectly from the very beginning. We are at your location to integrate the lubrication system into your existing process and infrastructure until it is ready for operations. If you wish we can accompany you after completing the commissioning process and take care of fine adjustments and the necessary adaptations. For important tasks such as these we rely exclusively on our own proven skilled personnel, who have comprehensive know-how and many years of experience. That means you can always be sure: when the name “Eckardt” is on the label, you get Eckardt! You wish to learn more about how we install our lubrication systems and get production started? Contact us! 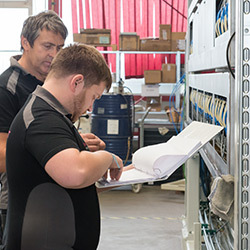 A quick once-over to see if everything is still running, tick the box and on to the next customer... that might be how service and maintenance look like elsewhere – but not at Eckardt! We invest a lot of time in your needs to ensure you are quickly, expertly and properly cared for in all respects. Regular maintenance of our systems operating across the globe is carried out by our own service personnel. Even if the distances are somewhat longer: we never send anyone else, we go ourselves! There are no off-the-shelf maintenance agreements at Eckardt. Our service agreements are always drawn up taking concrete customer requirements into consideration. Transparent and reliable. We are also extremely flexible and efficient when it comes to supplying spare parts. We put together a basic, individual package for our customers; this includes all of the important parts for those areas particularly subject to wear; the objective is to guarantee system operations in the long term. We realize additional requirements for spare parts quickly and reliably. Services made to measure – what are you looking for in this regard? Let us know! Could your Eckardt system do with freshening up? That is where our “retrofit” experts come in. We’ll modernize all mechanical and electrical aspects of your system. We place particular focus on the controls; in doing so we pay attention to all of the components involved, for instance, also replacing out-of-date industrial PCs. As always, we draw exclusively on the know-how within our own ranks for these tasks – our engineers work closely together with you. Our “retrofit” package also includes numerous services – in particular everything needed to refurbish the mechanical workings of your systems. Get the best out of your Eckardt system – we will bring it up to date. The best thing to do is to make an appointment with us now.